It’s chaotic. It’s frenetic. Sunday morning is unfolding at family homes across Australia. Mum’s trying to enjoy a relaxing moment eating breakfast, drinking coffee, and perhaps hoping to catch up on some fun reading. The kids are jostling for attention. Your daughter’s in her tutu and tiara ready for her next dance competition while your son is in his uniform and gearing up for his big soccer match. Meanwhile Dad's trying to take a quick work call in the corner before becoming taxi driver for the day. Is this what your Sunday morning looks like? Or would you have a big, friendly golden retriever lounging on the bed too? Would the kids be nicking Mum’s breakfast or even throwing it through the air? Perhaps a hockey stick would replace the soccer ball and there would be a basketball uniform instead of a tutu... But you can picture it, can’t you? Why is it that our family portraits are such formal affairs in a studio? Why do we choose contrasting outfits and arrange ourselves in stiff, unnatural poses? We end up with an array of similar shots, choose one for the wall, and pack the rest into a drawer never to see the light of day. What if you could commission a unique family portrait that really captured the essence and personality of your family? And end up with one beautiful photograph, a piece of art, to remind you of that moment in time and hang it on your wall? The Sunday Morning concept arose out of a submission to a family magazine. Many of the photographs were your standard family group poses and I wanted to approach the shoot in a non-traditional way. I decided to stage a master bedroom as this is often where mum will try to have a snoozy breakfast in bed..and ultimately it will always be crashed by the kids . Studio lighting helped to create the effect of morning light streaming onto the bed. My friend brought her family along and we were going to capture some nice mother-daughter images in a relaxed setting. Their son came in from playing xbox and started playing with his soccer ball and eyeing off the pancakes. Then her husband sat down in the frame to take a phone call. I kept shooting amid the chaos and the most unusual photographs began to take shape. They were all so relaxed and playful that it enabled me to bring their personalities into the image. 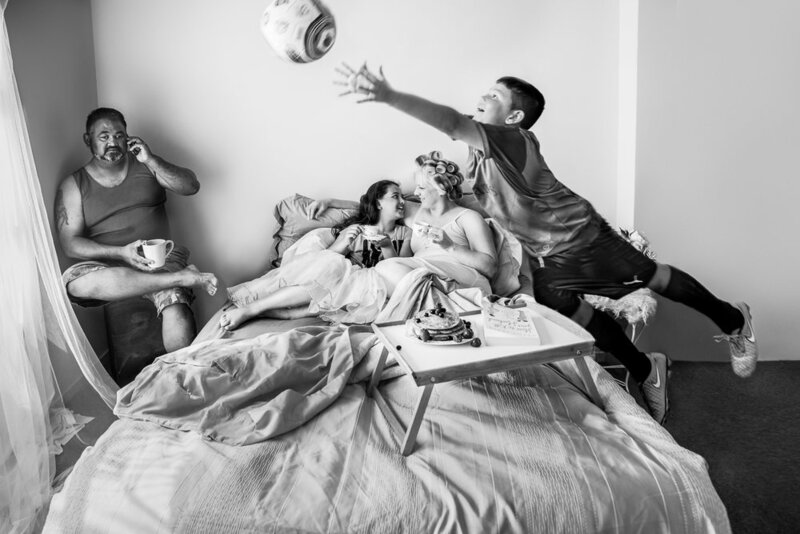 Instead of just a photograph to celebrate the mum, we ended up with a series of documentary-style images capturing the energy of family life. And this families in particular. *note* limited bookings are available, session needs to be done before 25th April to guarantee Wall Art delivery for Mother's Day.